This ingenious puzzle consists of a loop of six segments. Each segment has two coloured tunnels containing three coloured balls. Some tunnels connect up to form a loop containing 18 balls. The balls in this loop can be shifted around. The segments are connected to each other with a hinge so that the shape of the puzzle can be changed, and by doing so the loop can be formed using the other tunnels of the segments. The aim is to put each coloured ball in the tunnel of the same colour. This is a fascinating puzzle, and very confusing. The puzzle feels strangely organic when you change its shape, and it takes a long time to get used to where the loop forms from the tunnels. Astrolabacus was invented and designed by John D. Harris (Möbius Phobias). It was patented on 8 July 1997, US 5,645,278. By the way, the inventor is not the same John Harris who invented the Rolling Cubes Puzzle. The puzzle is symmetrical, and remains so even when it changes its shape (180 degree rotational symmetry around a central axis). The balls therefore occur in pairs which remain opposite each other. There are four colours (red, blue, green, yellow), and the tunnels are coloured in such a way that every pair occurs exactly once. There are 18 pairs coloured balls which can be permuted in 18! ways. The balls of a pair can also be swapped, so there are (at most) 18!·218 ways to arrange them all. There are however indistinguishable ball pairs - there are 6 pairs of colours, all occurring three times. This gives a total of 18!·218/3!6 = 35,972,733,468,672,000. Pantazis'Puzzle Paradise, has a solution. Segment: One of the six hinged parts of the puzzle. Tunnel: Half of a segment, containing 3 balls. 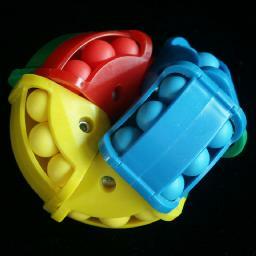 Action loop: The loop of 6 tunnels, containing 18 balls that can be shifted. GREEN-Yellow ball: The green ball in a green-yellow opposing pair of balls. Similarly for other colours of course. GREEN-Yellow tunnel: The green tunnel in a green-yellow pair of tunnels. Green-Yellow position: The shape where the green-yellow pair of tunnels is brought together in the middle of the puzzle. Clockwise shift of the action loop: Hold the puzzle so that the action loop is fully visible, and push its balls in a clockwise direction. Phase 1: Solve the Green-Yellow tunnel. Do whatever moves you need to make sure that there is no Green-Yellow (or Yellow-Green) pair of balls in the Green-Yellow tunnels (This is not strictly necessary but it makes the description easier). If, in the Green-Yellow position, you can find a Green-Yellow pair in the action loop then continue with step e.
If there is a Green-Yellow pair in the Red-Yellow tunnel then, in the Red-Blue position shift the loop so that the ball pair lies in the Blue-Yellow tunnel, and continue with step e.
There must be a Green-Yellow pair in the Red-Blue tunnel. In the Red-Yellow position shift the loop so that the ball pair lies in the Blue-Yellow tunnel, and continue with the next step. In the Green-Yellow position there must now be a GREEN-Yellow ball in the action loop. Shift the loop so that it lies in the RED-Green tunnel, just adjacent to the BLUE-Yellow tunnel. In the Blue-Green position, shift the loop anti-clockwise one step, so that the GREEN-Yellow ball enters the GREEN-yellow tunnel. Repeat steps b-g twice more, so that all GREEN-Yellow balls lie in the GREEN-Yellow tunnel. Phase 2: Solve the Red-Yellow tunnel. Do whatever moves you need to make sure that there is no Red-Yellow (or Yellow-Red) pair of balls in the Red-Yellow tunnels, but do not disturb the already solved Green-Yellow tunnel. If, in the Red-Yellow position, you can find a Red-Yellow pair in the action loop then continue with step d.
There must be a Red-Yellow pair in the Blue-Green tunnel. In the Green-Yellow position shift the loop so that the ball pair is no longer in the Blue-Green tunnel, and continue with the next step. In the Red-Yellow position there must now be a RED-Yellow ball in the action loop. Shift the loop so that it lies in the BLUE-Yellow tunnel, just adjacent to the RED-Green tunnel. In the Blue-Red position, shift the loop anti-clockwise one step, so that the RED-Yellow ball enters the RED-yellow tunnel. Repeat steps b-f twice more, so that all RED-Yellow balls lie in the RED-Yellow tunnel. Phase 3: Solve the RED-Green pieces. The RED-Green balls will first be placed together inside the RED-Blue tunnel, and only then put correctly into the RED-Green tunnel. Do whatever moves you need to make sure that there is no Red-Green (or Green-Red) pair of balls in the Red-Blue tunnels, but do not disturb the already solved Green-Yellow and Red-Yellow tunnels. In the Green-Yellow position there must be a RED-Green ball in the action loop. Shift the loop so that it lies in the RED-Green tunnel, just adjacent to the GREEN-Blue tunnel. In the Red-Yellow position, shift the loop anti-clockwise one step, so that the RED-Green ball enters the RED-Blue tunnel. Repeat steps b-c twice more, so that all RED-Green balls lie in the RED-Blue tunnel. In the Red-Yellow position, shift the loop clockwise three steps, so that the three RED-Green balls enter the RED-Green tunnel. Phase 4: Solve the Blue tunnels. In this phase we will put all the blue balls in the blue tunnels. The blue balls will not necessarily be in their correct blue tunnels, so their opposite balls will probably still be mixed. Examine the BLUE-green tunnel, in particular the ball adjacent to the GREEN-red tunnel. This end of the BLUE-green tunnel will be the focus of this phase - any non-blue balls are brought to that spot, and then changed to blue. 1. In the Red-Yellow position, shift the loop anti-clockwise three steps. 2. In the Green-Yellow position, shift the loop anti-clockwise one step. 3. In the Red-Yellow position, shift the loop clockwise three steps. Repeat step a until the ball at the end of the BLUE-green tunnel is blue. 1. In the Red-Yellow position, shift the loop clockwise one step. 2. In the Green-Yellow position, shift the loop clockwise one step. 3. Repeat steps 1-2 until there is a non-blue ball at the end of the BLUE-green tunnel. Go to step b to fix that ball. 1. In the Red-Yellow position, shift the loop clockwise three steps. 2. In the Green-Yellow position, shift the loop clockwise three steps. Go to step a to fix the remaining balls. Phase 5: Solve the YELLOW-blue tunnel. In the last two phases we will solve the YELLOW-blue, RED-blue, and GREEN-blue tunnels. Note that all the opposite balls are blue, so we need only concentrate on one the non-blue side. In the Red-Yellow position, shift the loop clockwise two steps. Repeat this as often as necessary to make the ball in that position yellow. In the Red-Yellow position, shift the loop anti-clockwise one step. Do exactly the same as step b, so that there are now two yellow balls in the YELLOW-blue tunnel. Again do exactly the same as step b, so that there are now three yellow balls in the YELLOW-blue tunnel, in other words the tunnel is solved. Phase 6: Solve the RED-blue and GREEN-blue tunnels. 3. In the Red-Yellow position, shift the loop clockwise one step. 4. In the Green-Yellow position, shift the loop anti-clockwise one step. 5. In the Red-Yellow position, shift the loop anti-clockwise one step. 6. In the Green-Yellow position, shift the loop anti-clockwise one step. 7. In the Red-Yellow position, shift the loop anti-clockwise one step. 8. In the Green-Yellow position, shift the loop clockwise one step. 9. In the Red-Yellow position, shift the loop clockwise one step. 10. In the Green-Yellow position, shift the loop clockwise one step. Repeat this until both positions adjacent to the YELLOW-blue tunnel are correctly filled. 1. In the Red-Yellow position, shift the loop clockwise two steps. 3. In the Red-Yellow position, shift the loop anti-clockwise two steps. 4. In the Green-Yellow position, shift the loop clockwise one step. If necessary, repeat this until the middle ball in the RED-blue tunnel is red. 1. In the Green-Yellow position, shift the loop anti-clockwise two steps. 2. In the Red-Yellow position, shift the loop clockwise one step. 3. In the Green-Yellow position, shift the loop clockwise two steps. 4. In the Red-Yellow position, shift the loop anti-clockwise one step. If necessary, repeat this until the puzzle is solved.